After going through this legend of evergreen trees, you will be able to understand the importance of compassion, love and care. You can understand the right essence of the message of Christmas through this story. It carries the message that you should be ever ready and available with a giving heart so that you can understand the joy of sharing everything you have with others. Surely, you will be rewarded in one form or the other for such selflessness. Patience and kindness are the two essential virtues you need to have a fulfilling life. It will make you a better human and keep you happy always. In the story mentioned below, you will see how the helpless bird struggles to find a shelter to survive during the extreme winter. When it approaches others for help, it finds no positive response but, after some struggle, it does find kindness. Read further and find out how the bird finally finds help and what happened later. Since winter was fast approaching, all the birds began to fly towards south for warmer ir and delicious berries. A little bird broke its wings on the way and could not fly further along with the other birds. The poor thing fell into the strange woods. When the winters came, it started snowing and soon, the entire forest was covered with snow. The little bird found it very difficult to even fly up to a tree. As the ground was covered with snow everywhere, she could not even spot worms and hence feared for her life. The only way out for her was to ask for help from the trees, in order to stay alive. It was of no use as the trees weren't kind at all. She approached the birch tree which was vain and proud over its beauty. It refused help saying that it had to protect the birds of the forest first. The oak tree refused help saying that it was scared that the bird would overstay and eat up its acorns in spring. The otherwise gentle willow tree too refused to provide any help to the bird. The bird lost all hope and was distressed. With all its efforts in vain, it tried to fly again but the broken wings were of no help. Seeing this, the spruce tree asked her what was wrong. When the bird shared her problem with it, the tree gave the bird the thickest and warmest branch of all. Seeing the kindness of the spruce tree, the pine tree also offered protection to the tree and the bird by protecting them from the North Wind throughout the winter season. Seeing this, the little juniper tree also came up to the bird's aid and offered its berries to satisfy her hunger. Hence, winter passed by and the bird was safe and warm. In due time, her broken wings were also healed and by spring, she was ready to fly back to her friends. The behavior of all the trees was kept in check by the Frost King. 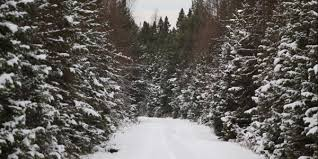 So, it commanded the North Wind not to touch even a single leaf of the generous spruce, pine and the juniper trees. However, the North Wind plucked the green shining leaves of the oak, willow and other trees for refusing to help to the bird. The winds left them bare for the winters so that they had nothing to protect themselves from the rain, snow and sleet. Thus, it is for this reason that the leaves of the pine, spruce and the juniper are green always and these trees are referred to as the evergreen trees.